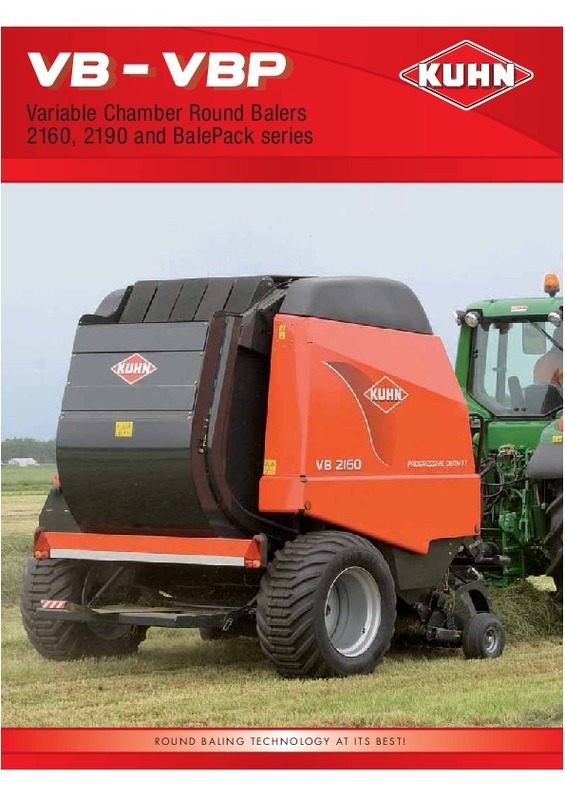 VB – VBP Variable Chamber Round Balers 2160, 2190 and BalePack series VB / VBP 2160, 2190 KUHN ROUND BALERS The ability to produce top quality bales in all crop conditions sets KUHN balers apart from all others. 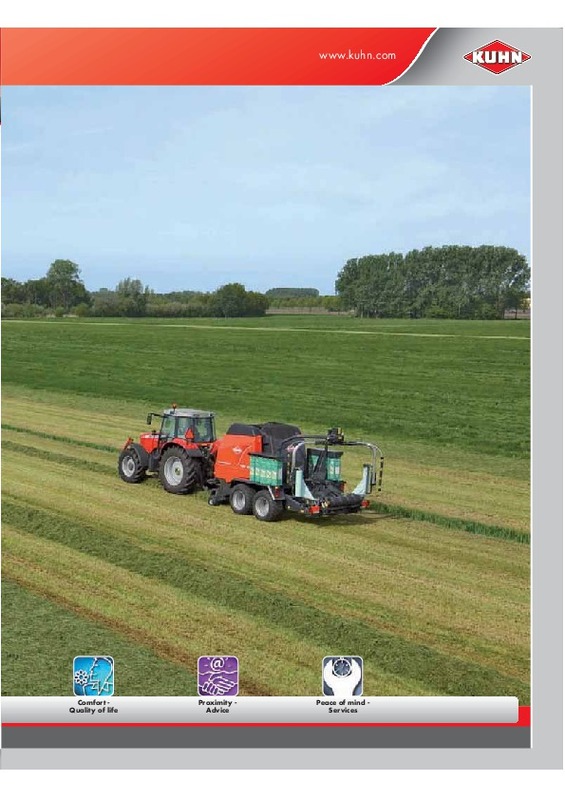 Every step in the baling process has to be coordinated and optimized, accounting for crop conditions, field conditions and weather, as well as crop handling and storage. 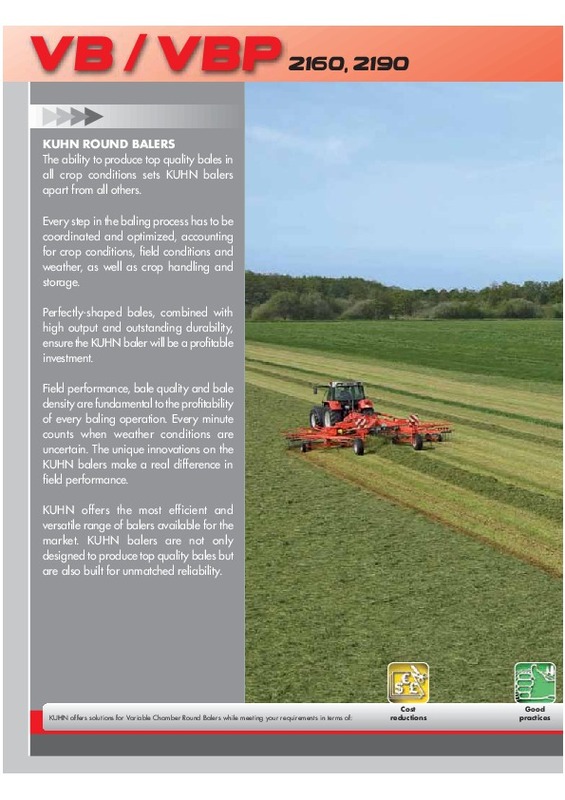 Perfectly-shaped bales, combined with high output and outstanding durability, ensure the KUHN baler will be a profitable investment. 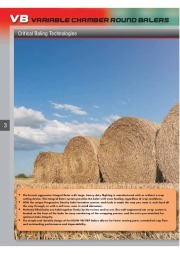 Field performance, bale quality and bale density are fundamental to the profitability of every baling operation. Every minute counts when weather conditions are uncertain. 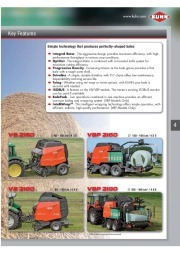 The unique innovations on the KUHN balers make a real difference in field performance. KUHN offers the most efficient and versatile range of balers available for the market. 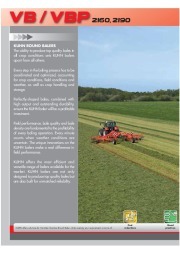 KUHN balers are not only designed to produce top quality bales but are also built for unmatched reliability. KUHN offers solutions for Variable Chamber Round Balers while meeting your requirements in terms of: Cost reductions Good practices www.kuhn.com Comfort Quality of life Proximity Advice Peace of mind Services VB VARIABLE CHAMBER ROUND BALERS Critical Baling Technologies W 3 The forced, aggressive Integral Rotor with large, heavy-duty flighting is manufactured with or without a crop cutting device. 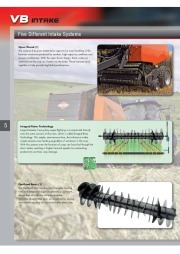 This Integral Rotor system provides the baler with even feeding regardless of crop conditions. 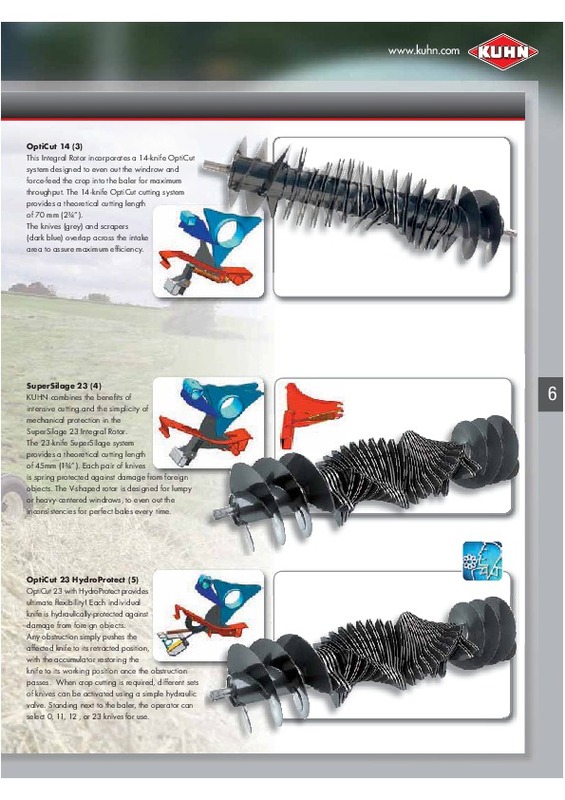 With the unique Progressive Density bale formation system, each bale is made the way you want it, rock hard all the way through, or with a soft core, even in small diameters. Perfectly-filled bales are held together firmly by the twines and/or net. 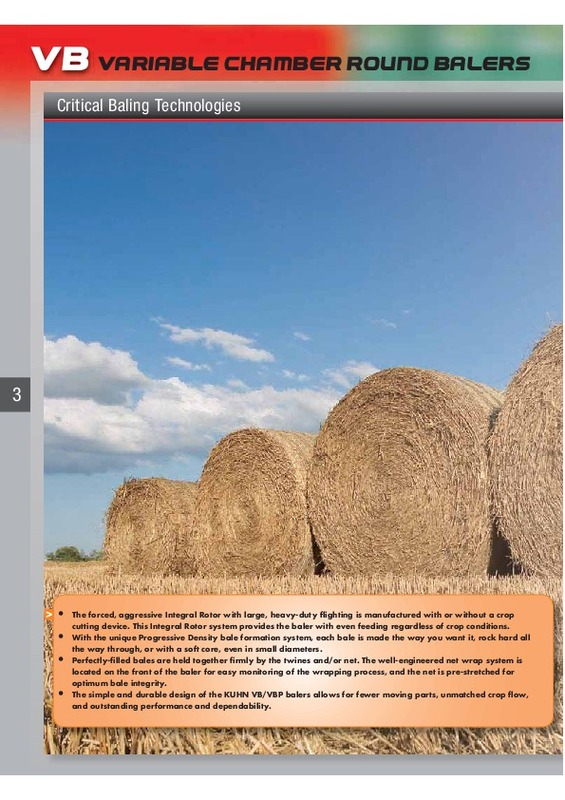 The well-engineered net wrap system is located on the front of the baler for easy monitoring of the wrapping process, and the net is pre-stretched for optimum bale integrity. 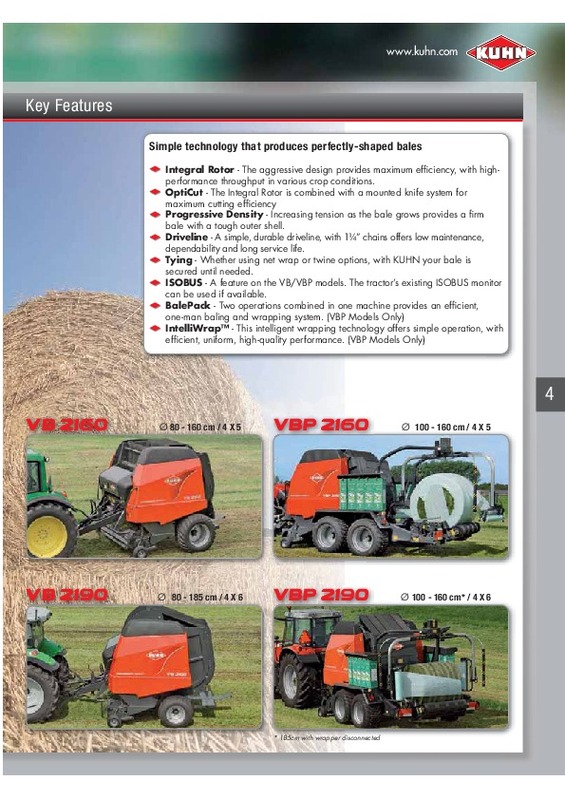 The simple and durable design of the KUHN VB/VBP balers allows for fewer moving parts, unmatched crop flow, and outstanding performance and dependability. 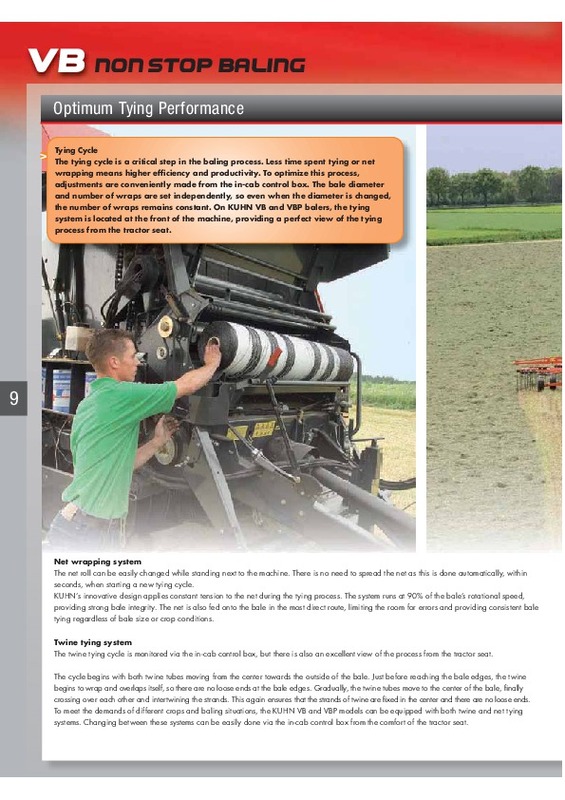 v www.kuhn.com Key Features Simple technology that produces perfectly-shaped bales Integral Rotor – The aggressive design provides maximum efficiency, with highperformance throughput in various crop conditions. OptiCut – The Integral Rotor is combined with a mounted knife system for maximum cutting efficiency Progressive Density – Increasing tension as the bale grows provides a firm bale with a tough outer shell. Driveline – A simple, durable driveline, with 1¼ ” chains offers low maintenance, dependability and long service life. 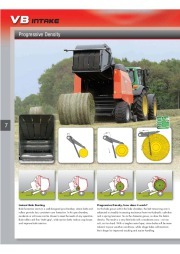 Tying – Whether using net wrap or twine options, with KUHN your bale is secured until needed. 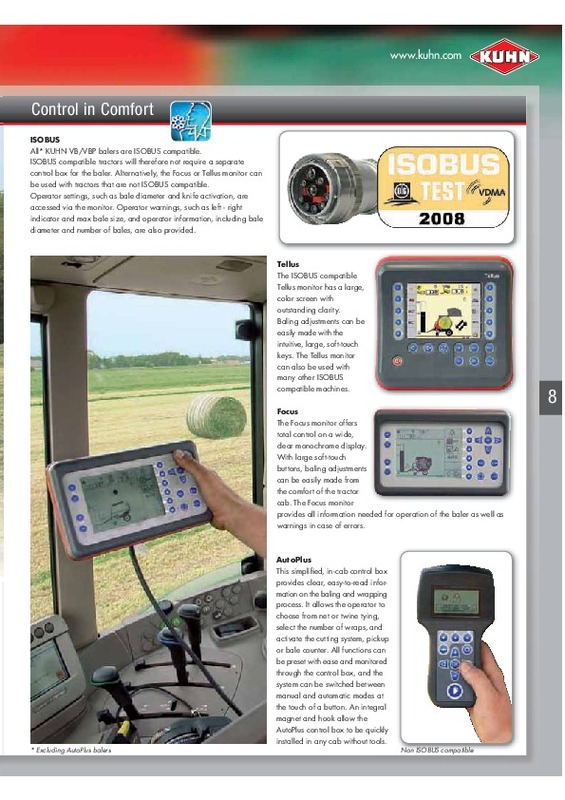 ISOBUS – A feature on the VB/VBP models. 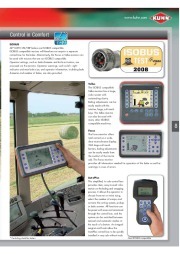 The tractor’s existing ISOBUS monitor can be used if available. BalePack – Two operations combined in one machine provides an efficient, one-man baling and wrapping system. (VBP Models Only) IntelliWrapTM – This intelligent wrapping technology offers simple operation, with efficient, uniform, high-quality performance. (VBP Models Only) 4 VB 2160 Ø 80 – 160 cm / 4 X 5 VBP 2160 Ø 100 – 160 cm / 4 X 5 VB 2190 Ø 80 – 185 cm / 4 X 6 VBP 2190 Ø 100 – 160 cm* / 4 X 6 * 185cm with wrapper disconnected VB INTAKE Five Different Intake Systems Open Throat (1) The wide pickup gives tremendous capacity for easy handling of the heaviest windrows produced by modern, high-capacity combines and mower conditioners. With the open throat design, there is also no restriction on the crop as it feeds into the baler. These features work together to help provide high field performance. 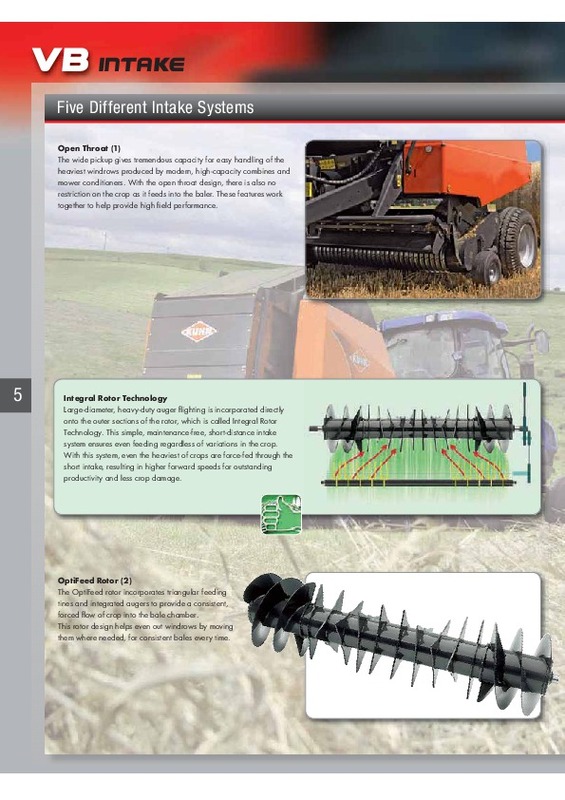 BALE TRACK 5 Integral Rotor Technology Large-diameter, heavy-duty auger flighting is incorporated directly onto the outer sections of the rotor, which is called Integral Rotor Technology. 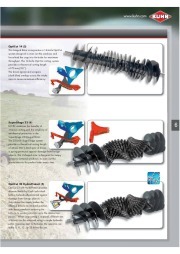 This simple, maintenance-free, short-distance intake system ensures even feeding regardless of variations in the crop. With this system, even the heaviest of crops.